Suzuki has always been compared to her sister whether it was with her own love interests that liked her sister or between grades. Being tired of it all, she decides to go to a high school as far as possible from her sister's school. She enjoys her new school very much. One day, after a volleyball game, she sees her senpai crying. After promising to tell no one what she saw, he starts to talk to her. 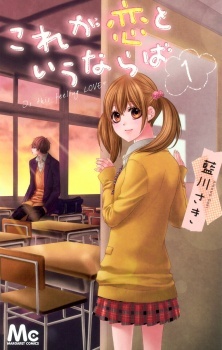 Kore ga Koi to Iu naraba was published in French as Is this feeling Love? by Soleil from July 3 to October 9, 2013. Aikawa Saki does it again! A tale of insecurity and self doubt through the eyes of a confused high school aged shoujo. To mix things up, she's added an elder sister who casts a wide shadow over poor Sora Suzuki (our protagonist), a couple of bishounen, two of whom have a past with said sister and some unreasonable teenage angst which will propel the story forward. Who should read this manga: Younger/first time shoujo romance/high school fans who enjoy a well drawn series and aren't too discerning about plots and storylines. Who should avoid it: Most seasoned shoujo readers. Romance is almost nonexistant till chapter 3, the same issue about Sora feeling incompetent when compared to her sister keeps coming up and her inner stream of consciousness borders on annoying. The story is about Sora's attempts to fit in and have a normal fun high school experience away from her sister's infamy so that she doesn't constantly need to hear "Your oneesan is so..." or "I don't like you, I prefer your oneesan". You get the gist. Pacing seems slow-ish, though that's always been a bit of an issue in Aikawa Saki's works. Stuff which is of little consequence has 12 pages devoted to it, but character dynamics and chemistry which needs to be explored may not be broached in the first volume at all! Art is A+ per usual. Nice clean bishies and panels, not too flowery, fun backgrounds, cute chibi expressions and gestures. Eyes are big, but don't veer into annoying category. Story seems OK, I've yet to see how it'll pan out. Three chapters in, it seems this may just turn out to be more mature than Aikawa Saki's previous works where the hero simply claims he loves the protagonist more than anyone else and everything is good with the world. Here, one of the bishies is actually trying to tackle the root cause of Sora's apprehensions and *gasp* character growth looks imminent! Overall, there isn't any particularly spectacular feature in this title that will make you want to procrastinate whatever work you're SUPPOSED to be doing and devote an hour or so to reading this. I feel you should wait for this one to finish with scanlation and then maybe if you're a fan of the art, go through both volumes at one go. For now, employ the wait-and-watch strategy and enjoy other works by Aikawa sama like Houkago, Sensei to Koi ni Ochiru.